In addition to director Marc Webb in production on The Amazing Spider-Man 2, Twitter has seen some great updates from Bryan Singer as he moves along on X-Men: Days of Future Past. Not many have been worthy of posting as an individual story, but today, Singer revealed a first look photo of a certain character from X-Men: First Class. 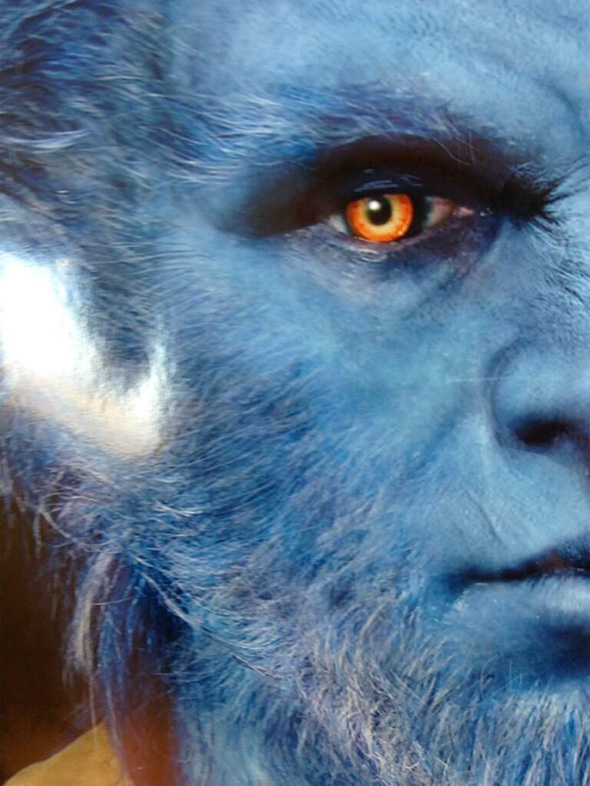 We're pretty sure this is character design art and not a first look picture of Beast, but it looks slightly different than the version Nicholas Hoult played in the first franchise prequel. Hoult is still playing the character, but it looks like the make-up may have changed a bit. Read on! Im sure im not the only one that would be ok with that. Would be great, but I think he actually said he didn't want to be in this. More of a triangle face. Which I suppose is more in line with the comic and animated series. Still...I liked the new direction FIRST CLASS was going with Beast's makeup. I only liked Beast's makeup when he was snarling. Other than that I think he just looked silly in First Class. It didn't help that the actor underneath all that stuff could barely move his mouth properly. He looked more like a Dr. Seuss character than a ferocious man-beast. I'm all about Kelsey Grammer bringing back his commanding presence in the next movie. They are still giving Singer money to make movies? After all his recent failures? Damn. Only tweet I want to see from Singer is that he's stepping down as director from any X-Men films. His version of X-Men is terrible. I wish they would have kept Matthew Vaughn on this, this movie seems like it's going to be way too overcrowded with characters just for the sake of connecting it with Singer's first films. I could be wrong though. Most of these people will essentially be in cameos.